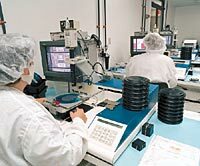 Semi-automatic picking - Utilizing video monitors and micro-manipulators for die centering. An auto pick and place head deposits good die in successive pockets or positions in a chip carrier. These systems have enhanced video, so a low magnification commercial visual may be performed prior to pick and place. Fully automatic systems - Utilizing machine vision. A wafer is mounted and aligned relative to the table. After positioning, information is entered and/or retrieved from a stored program. The machine is taught what bad die look like. The machine will then, at high speed, pick good die from the wafer and automatically place them into trays, gelpack, tape on tray, tape on frame, or tape and reel.